New Delhi: The Delhi High Court on Thursday dismissed the pleas of TTV Dinakaran and VK Sasikala challenging the Election Commission's order granting the AIADMK name and two leaves symbol to the faction led by Tamil Nadu Chief Minister E K Palaniswami. A bench of justices G S Sistani and Sangita Dhingra Sehgal upheld the EC's decision of 23 November, 2017, saying none of the grounds of challenge taken by Dinakaran and Sasikala were sufficient to set aside the poll panel's order. 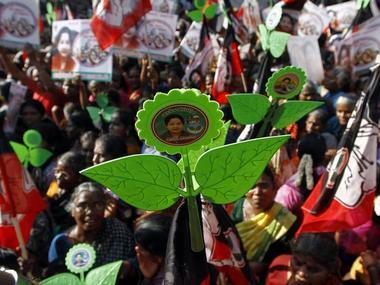 The court said there was no infirmity in the poll panel's decision to allot the AIADMK name and two leaves symbol to the faction headed by Palaniswami and his deputy O Panneerselvam. After the order was pronounced, senior advocate Abhishek M Singhvi, appearing for Dinakaran and Sasikala, urged the bench to direct the EC not to allot the pressure cooker symbol to anyone during the next 15 days so that they have time to move the Supreme Court and seek an appropriate relief from there. The EC, thereafter, agreed not to allot the 'pressure cooker' symbol to anyone for next 15 days in Tamil Nadu and Puducherry. The court had on 8 February reserved its decision in the matter after hearing arguments on behalf of the EC and the two factions vying for the AIADMK name and the party symbol. The bench had said it would deliver the judgement within four weeks in view of the 7 February Supreme Court order that the EC can decide Dinakaran's plea for an interim poll symbol, if the high court's decision does not come within four weeks. Dinakaran had floated Amma Makkal Munnetra Kazhagam (AMMK) after he and Sasikala were expelled from the Palaniswami-led AIADMK. The apex court had on 7 February also vacated its order of abeyance on the high court's interim decision of 9 March, 2018 directing the EC to allot a common symbol, preferably that of a 'pressure cooker', and a name to the then AIADMK (Amma) faction led by Dinakaran. The top court had said that since the matter was pending before the high court for final adjudication, there was no just reason as to why the interim arrangement of allotting 'pressure cooker' symbol by the poll panel ought not continue. 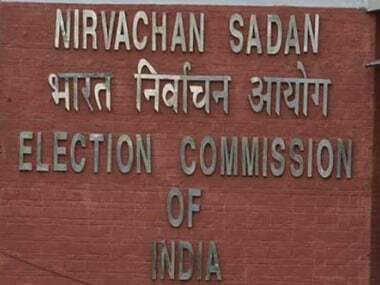 The apex court's order had come on an application filed by Dinakaran for a direction to the EC for allocating his group a common symbol, preferably 'pressure cooker', as a by-election to fill the vacant assembly seat of Thiruvarur in Tamil Nadu had been announced for 28 January. Later, the by-election to Thiruvarur seat was rescinded by a notification issued by the EC on 6 January. 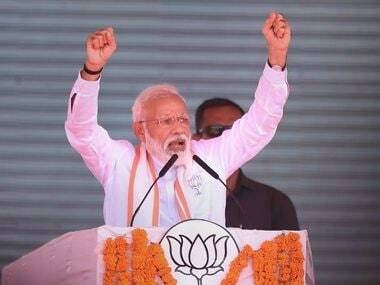 The 'pressure cooker' symbol was allotted as an interim measure, to Dinakaran faction last year during the bypolls of the R K Nagar constituency in the state which he had won with a margin of over 40,000 votes. The EC in March 2017 had given the 'hat' symbol to the Sasikala-Dinakaran group after it froze the use of the 'two leaves' symbol to which the group led by Palaniswami and Panneerselvam had also staked claim. 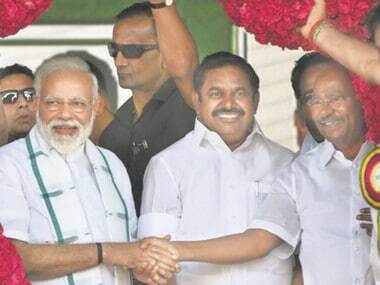 The Palaniswami-Panneerselvam faction had at the same time been granted the 'electric pole' symbol. 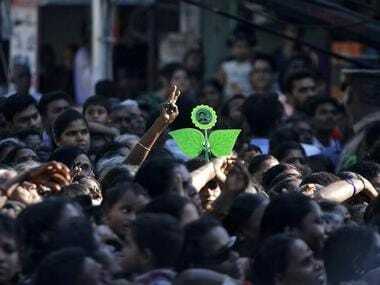 However, on 23 November, 2017, the poll panel had ruled in favour of the Palaniswami-Panneerselvam faction by allotting the 'two-leaves' symbol to them. The symbol issue has been lingering since April 2017 in the aftermath of the announcement of the by-poll to Radha Krishnan Nagar constituency in Tamil Nadu following the death of AIADMK supremo J Jayalalithaa in December 2016.